Was Castrol GTX ever a suitable and therefore recommended oil for use in a Mini? I'm aware that NSW Police used GTX labelled lubrication stickers on the quarter vent (see below). My Sept 1970 car has a label on the bonnet slam panel that specifies Castrol XL 20W-50MS. These are castrol oil stickers fitted to a 1967 and 1969 Mk1S. When i started work in a servo 4000 years ago, we had only two grades in the workshop, standard 30 and multigrade. GTX these days loses pressure on freeway running unless you have a cooler. Even cheap oils like Gulf Western 20w50 leave it for dead. Like gtogreen said, Castrol XL was the recommended oil for our 1969 mini K. I used it until Castrol GTX came out shortly after and was heavily promoted and recommended for all BMC front drive engines in the early '70s as their premium oil. Remember those drawings of Evan Green (wearing winner's laurel) and a jumping rally S in the ads? XL disappeared. Where was that Lubrication sticker located? Never saw one on mine. then18/2/71 (12,051m) - all in Bega. and within the 60 day limit. Next recorded service was by the first private owner, at Lancaster Mtrs Blacktown on 17/9/71 (31,150m). It is said the Dept of Supply sold them off around the 30,000mile mark. Whether it got another service in the 6 months before it was sold is uncertain. On the bonnet slam panel - see below. By the way, perhaps I should've mentioned at the outset that I'm not seeking advice or recommendations on which of the current oils to use in my engine, once it's been rebuilt. There's plenty of posts about that. 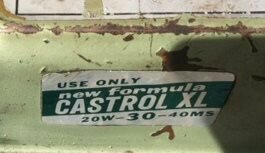 I'm actually looking at having the black sticker remade and just wanted know if Castrol XL 20W-50MS was the only Castrol grade used in Mini motors back in the early 1970's or whether GTX successfully replaced it. Doug, I think you have unveiled the start of the sticker conspiracy....... It seems that anyone and everyone who touches my car, seems to think they have rented space on my rear window. So service centres, windscreen replacement mobs, car dealers, car washes etc without my permission add me to their advertising chain ( put a sticker on my screen)..... maybe i need to read the fine print, and maybe it was these castrol guys back in the 60s and 70s who started all this. When was GTX released? I think it may have been mid 71. Maybe around 1970 at the first Castrol 6 Hour at Amaroo? Thanks Timmy, well spotted. The Oz drivers handbooks and the black workshop manual don't seem to mention GTX, but that's not especially surprising. In the 1960's my father manufactured and printed plastic bags.I remember he printed the labels for the GTX containers(late 60's). Back then the polythene wrapper was attached to the container. Also about the same time his business supplied BMC with plastic bags for various parts, one being windscreen bags. These had to be made by hand (because of the length) and I remember making many of these after school and on weekends. This contact with BMC lead to an offer of a tour of the Zetland Plant. In 1970 as a 15 year old along with my father and his sales manager we had a tour of the plant. We saw every part of the plant, Mini production as well as Tasman and Kimberley. At the time I had a Mini De Luxe (EPH 352) and I was given a trade order form which I could use at any BMC dealership. I never used it and probably still have it somewhere.